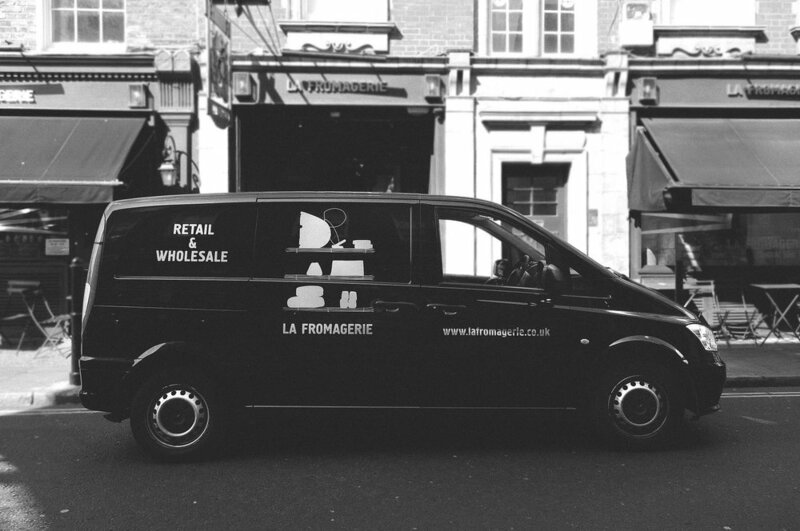 'LA FROMAGERIE began over twenty-five years ago & has been supplying farmhouse cheese to restaurants & shops since 1991. From humble beginnings in a garden shed, our wholesale business now operates from specially designed cheese rooms devoted to maturing & refining cheese. We support raw milk production & respect for the animals & the land. We source directly from small artisan cheesemakers from around the world. The wholesale business is run by a dedicated team of cheese-mongers, who are not only knowledgeable about cheese & the care needed to bring it to its optimum point of taste, but also have the skills required to ensure each customer is given a bespoke cheese offering suited to their requirements; working with sommeliers, the front of house & chefs, we ensure that quality, training & price points are met. We have four ripening rooms – for hard & semi-hard, white bloomy & goat, fresh and, finally, blue. The orange rinds of Epoisses are washed with a Marc de Bourgogne; similar rinds are washed in brine or wine mixtures. Italian cheeses are rubbed in olive oil to ensure they don't dry out. White bloomy (geotrichum & candidum) moulds on cheeses such as Brillat Savarin or Brie need careful monitoring on a daily basis. Our team works methodically to ensure every cheese reaches its peak of taste & texture. For us, staff training is paramount. Sessions can be held either at our warehouse or at your premises, especially when the season changes. Our cheese offering is tailored to the needs of our customers. We want to work with your team to create the right cheeseboard for your menu; from your sommelier to create wine-friendly pairings; with your chef, sourcing the right cheeses to cook with at the right price point; and ensuring your floor staff are confident in cutting, caring for & describing the product. Tasting notes will be provided, along with a bi-monthly newsletter updating you on what is best & coming into season. We offer our Own Label Biscuits, made to recipes developed in-house and available in five varieties: Caraway, Charcoal, Oat, Rye & Spelt, each designed to pair with specific styles of cheese. For our clients we also source custom implements for your restaurant or shop – cheese cloches, wicker trays with glass inserts, cheese knives, cheese wires, marble slabs & stoppers for soft cheese. Orders can be left by telephone or email. If you'd like to discuss your order with a cheesemonger the office is open from 7am - 3pm, Monday - Friday. We deliver Monday - Friday; in emergencies our shops are happy to accommodate weekend top-ups when possible. We ensure consistency in quality and you can be assured of a personal service. The same team receiving orders is maturing the cheese as well as processing orders each morning. Whilst much of our list concentrates on particular regional varieties for cheese boards & trolleys, we have an extensive selection of fresh & stretched curd cheeses for the kitchen – all available by pre-order. Standing orders can also be set up. Overseen by Michael, our team is comprised of dedicated Wholesale Cheesemongers. Walter & Gyula drive our vans. Quality Control is overseen by Amelie. Accounts is headed up by Cecile and Zohirul.